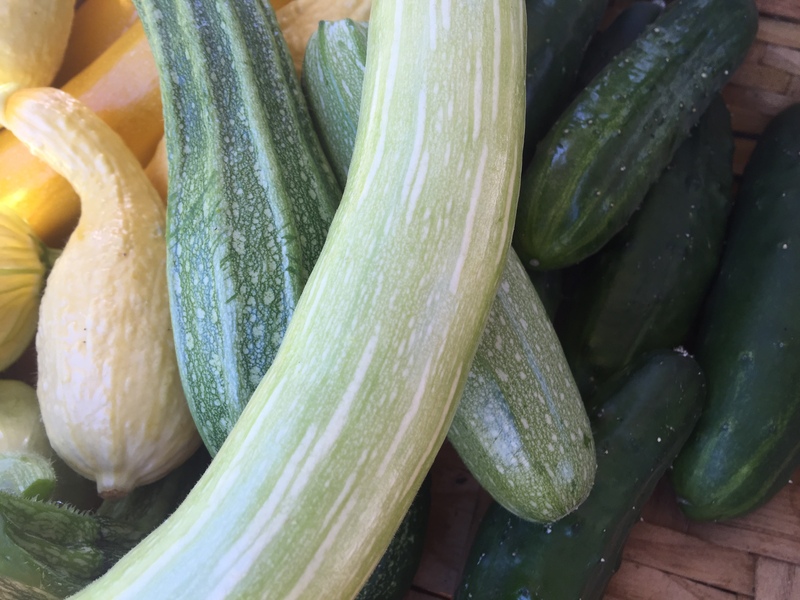 Fresh cucumbers, carrots, multiple varieties of heirloom tomatoes, and sweet red grapes- these are just some of the delicious produce that we were treated to when we stumbled upon Ariadne Garden in Portland, Oregon. Last Saturday I spent the afternoon hunting wild fruits and herbs with Kezia Wineburg, the editor of an excellent online travel magazine called SITUATE. We’d been fairly successful up to that point and our bag was half-full of apples and pears we found growing in the public spaces of portland. We didn’t expect to find Ariadne Garden, a local community-run garden tucked away in the middle of a forest of houses. At the entrance to the garden we found a small, but well-stocked stand of fresh produce picked that morning. Upon arrival, we were welcomed by Tamara and Nar, two volunteers working to harvest the ripe fruits and vegetables before rotating to their fall crops. Tamara trimmed grapes as she amiably told us about how the land was donated by Kim McDodge, a woman who purchased the land with money she received as part of an inheritance, to be used as part of the Oregon Sustainable Agriculture Trust (OSALT) in portland. Tamara and Nar went on to discuss the decline they’ve seen in sales over the last few years, partly due to the success of a nearby farmer’s market and partly due to their own success. Some of the people who volunteered in the past have started their own gardens and are growing things at home. Tamara seemed a little proud about this, and there’s no reason she shouldn’t be. Part of the mission of Ariadne is to teach people in the area how to grow their own food, not just to be another source of it. While she explained this, we were treated to some of the seedless grapes she was trimming as she spoke. One of the advantages of the community garden that struck me as particularly useful was the fact that they have all of the tools and equipment necessary for gardening right at Ariadne, so those who don’t have the space, or land of their own are free to participate- though seeds are available for purchase if you decide you wanted to grow at home. This is an option pursued by some of the volunteers in addition to the work they do at Ariadne. Nar is a gregarious man with the most delicious Persimmon Tomatoes I have ever tasted. Clearly, they were getting more out of their experience than the fruits and vegetables volunteers get to take home. This time of year in particular, Ariadne Garden is in need of volunteers. So much of the produce they’re growing is ready to be harvested, that they’re having trouble keeping up. They’re open Wendesdays and Saturdays from 10AM – 1PM, so there’s little chance of getting roped into more hours than you anticipate. Want to get involved? Click here for information or just show up when they’re open. Don’t live in Portland, but want to find a community Garden near you? Check out the American Community Gardens Association and go play in the dirt.